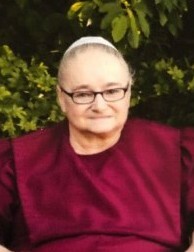 Ada W. Troyer, age 71, of Shreve, Ohio passed away peacefully, Tuesday April 2, 2019 at Sycamore Run Nursing Home, Millersburg, Ohio following a lengthy illness. Funeral services will be Friday, April 5th at 10 a.m. at New Life Fellowship, Holmesville, Ohio with Paul J. Yoder officiating. Burial will take place at New Life Church Cemetery. Friends may call Thursday from 2 to 4 and 6 to 8 p.m. at the church. Those wishing to share a memory or make online condolences may do so by www.alexanderfhinc.com. Family suggests memorial contributions be made to LifeCare Hospice, 1900 Akron Rd, Wooster, Ohio 44691 or to New Life Fellowship, 8580 CR 245, Holmesville, Ohio 44633. Ada was born August 26, 1947 in Tuscarawas County and was the daughter of the late Wayne D. and Mary A. Troyer. On April 20, 1967 she married Melvin L. Troyer. He preceded her in death on June 2, 2015. Ada was a homemaker and a member of New Life Fellowship. She enjoyed gardening, quilting and sewing and loved spending time with her family. She is survived by four sons and their spouses, Leon (Joanna) Troyer of Fredericksburg, Leroy (Janice) Troyer of Shreve, LaVern (LeAnna) Troyer of Sarasota, Florida and Lavon (Barb) Troyer of Berlin; 12 grandchildren, Anson, Kiara and Lexie Troyer, Krista (Henry) Miller, Karla (Lewis) Beachy, Kim, Kyle and Kari Troyer, Shaun (Lisa) Troyer, Sherri (Matt) King, Darryl and Marissa Troyer; two sisters, Amanda (Henry) Mast of Winesburg and Irene (Noah) Yoder of Sugarcreek; a brother, Delbert (Mary) Troyer of Sugarcreek; two sisters-in-law, Mary Raber of Charm and Edna Troyer of Sugarcreek; two brothers-in-law, Crist (Lizzie Ann) Miller of Charm and David (Amanda) Raber of Millersburg; and numerous nieces and nephews. She was preceded in death by her parents and husband, Melvin. The family wishes to express a heartfelt thank you to the nursing staffs at Sycamore Run, LifeCare Hospice and DaVita Dialysis of Millersburg for all the love, care and support that was given to her.